Here we see Frances Trollope (1780-1863), winsome, sad, shy, pretty, in Auguste Hervieu's portrait of her, now in the National Portrait Gallery. Frances Milton Trollope had the misfortune to marry a failure, a debtor, and by him to have a large family amongst whom tuberculosis was rife. Worst of all, his name now became hers. She is essentially Regency, of Jane Austen's time, when English women adopted the Grecian high waisted style of their French enemies. She is, in fact, a writer much like Jane Austen, except that she writes with more vinegar and a heart of gold. Her Jonathan Jefferson Whitlaw, the first novel against slavery, and her Michael Armstrong, Factory Boy, are really, with their engravings by her employee/colleague, August Hervieu, F.R.A., modern photo-journalism. For they place into her novels scenes they actually themselves witnessed. Herself the daughter of a clergyman, her Vicar of Wrexhill is a biting Molièresque satire against clergy abuse. The writing of Michael Armstrong was suggested to her by Hengist Horne, Southwood Smith and Leonard Horner, who also had Elizabeth Barret Browning write 'The Cry of the Children'. 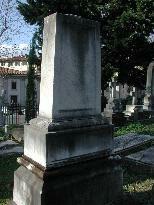 Frances Trollope earlier started Hiram Powers' career, having him sculpt Dante's Commedia in Cincinnati, Ohio. She satirized vulgarity with her highly successful Widow Barnaby series, with the unfortunate outcome that she became identified with that vulgarity. It was she who set the pace of many hours of writing each day to keep the wolf from the door that her son, Anthony, inherited. Cosmopolitan, broad-minded, she also wrote travel books, about America, about Paris, about Vienna, as well as novels. 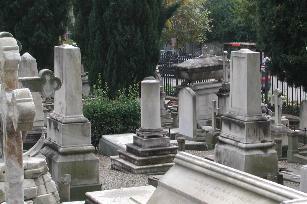 Her other surviving son, Thomas Adolphus Trollope, brought her with him to Florence, where, worn out, she died and is buried in Florence's 'English' Cemetery. With her are also her daughter-in-law, Theodosia Trollope, Theodosia's father, Joseph Garrow, who was the son of an Indian princess, her Jewish step-sister, Harriet Theodosia Fisher, and the family's maid, Elizabeth Shinner, five Trollopes in all. With her are also Elizabeth Barrett Browning, Walter Savage Landor, Arthur Hugh Clough, Hiram Powers and Southwood Smith, all beneath the great cypresses of Arnold Boecklin and Sergei Rachmaninoff's 'Island of the Dead'. 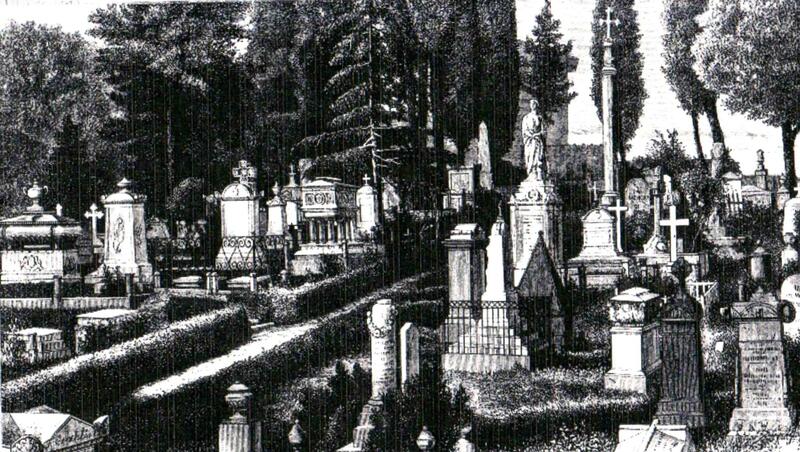 This web portal gathers together materials concerning Frances Trollope and her family. 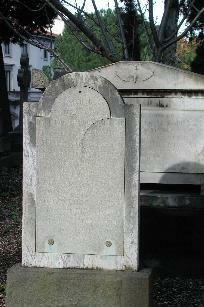 B11E §849/ FRANCES (MILTON) TROLLOPE/ ENGLAND/ Stele. Marmista ignoto. Sec. XIX, post 1863/10. Ambito toscano. Stele in marmo incisa con lettere capitali in lingua latina e numeri arabi, marmo sporco, posta su basamento in pietra serena, recinto in pietra serena con quattro colonnini spezzati. [M: A: 162. L: 87. P: 51.; P.s. A: 20. L: 96. P: 60; R: A: 38: 198. P: 83.] Iscrizione sepolcrale in latino incisa in lettere capitali e numeri arabi: FRANCESCAE TROLLOPE/ QUOD MORTALE FUIT/ HIC JACET/ DIVINAE AUTEM PARTICULAE AURAE/ MEMORIA/ NULLUM MARMOR QUAERIT/ APUD STAPLETON/ IN AGRO SOMERSET ANGLORUM/ A.D. 1780 NATA/ FLORENTIAE/ TUMULUM A.D.1863/ NACTA EST/ Registro alfabetico delle persone tumulate nel Cimitero di Pinti: Trolloape [Trollope] nata Milton/ Vedova Francesca/ Guglielmo/ Inghilterra/ Firenze/ 6 Ottobre/ 1863/ Anni 84/ 849/ Eglise Evangelique-Reformée de Florence Régistre des Morts: Françoise Veuve Trolloope, l'Angleterre, fille de Revd. Guillaume Milton, et de Marie, née Gressley, son épouse/ On the Trollopes in Florence, see Giuliana Artom Treves, Golden Ring, passim, ° archival holdings; Thomas Adolphus Trollope writes the Latin of the inscriptions for his mother, his wife, his father-in-law; Records, Guildhall Library, London: GL23777/1 N° 337 Burial 08/10 Age 84 Rev Pendleton / Thomas Adolphus Trollope, What I Remember, I & II/ NDNB entries for Trollopes, etc./ Chiesa Evangelica Riformata Svizzera, 1827-. 2009. FRANCES TROLLOPE-MILTON (1780-1863), was a matriarch of a clan of writers; herself, two sons and two daughters-in-law. To raise her family she had travelled to America and in Cincinatti had engaged the young Hiram Powers to do Dante's Commedia in wax. She arrived in Florence with her son Thomas Adolphus in 1843 and took up residence in Piazza Santa Croce, immediately entering into friendly relations with notables of the Court and the British community. 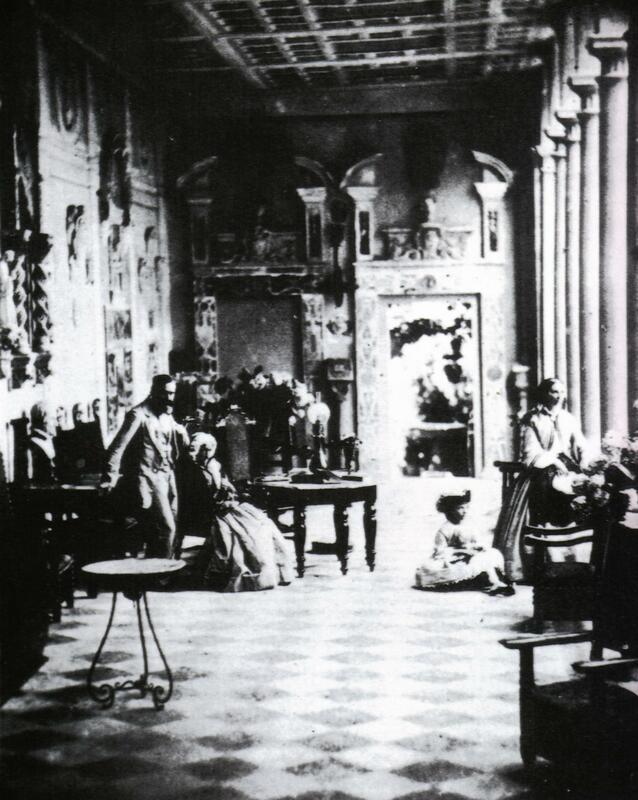 In 1849 she moved with her son and daughter-in-law Theodosia Garrow to a little house, Villino Trollope, in Piazza Maria Antonia (now Independenza). She dedicated herself to the theatre, organized Anglo-Florentine social life, and wrote prolifically, and her house became a meeting place and obligatory reference point even for such writers as Charles Dickens, Thomas Hardy and Thackeray. 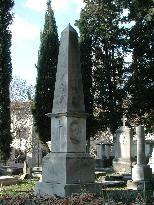 Her son's autobiography, What I Remember (London, 1887), is a splendid window on cosmopolitan and cultivated Florence. LS. The Mediatheca 'Fioretta Mazzei' has these two volumes, as well as books written by and about Fanny Trollope. B11E §904/ THEODOSIA (GARROW) TROLLOPE/ ENGLAND/ Stele. Marmista ignoto. Sec. 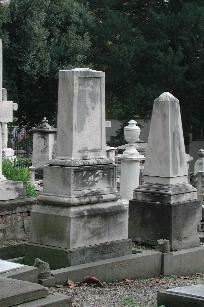 XIX, post 1865/4. Ambito toscano. Stele in marmo inciso con lettere capitali in latino e numeri arabi, marmo sporco, posta su basamento in pietra serena, recinto in pietra serena con quattro colonnini spezzati. ++Necessita di un intervento di pulitura. [M: A: 166. L: 86. P: 52.; P.s. A: 20. L: 95. P: 57. R: A: 47. L: 191. P: 85.] Iscrizione sepolcrale in latino incisa in lettere capitali e numeri arabi: THEODOSIAE TROLLOPE/ T. ADOLFI TROLLOPE CONIUGIS/ QUOD MORTALE FUIT/ HIC JACET/ OBITUM EIUS FLEVERUNT OMNES/ QUANTUM AUTEM FERRI MERUIT/ VIR EUGUI SCRIPTORES/ SCIT SOLUS/ JOSEFE GARROW ARMr FILIA/ APUD TORQEW IN AGRORUM DEVON ANGLORUM NATA/ FLORENTIAE/ NOMEN AGENS LUSTRUM/ AD PLURES ABIIT/ . 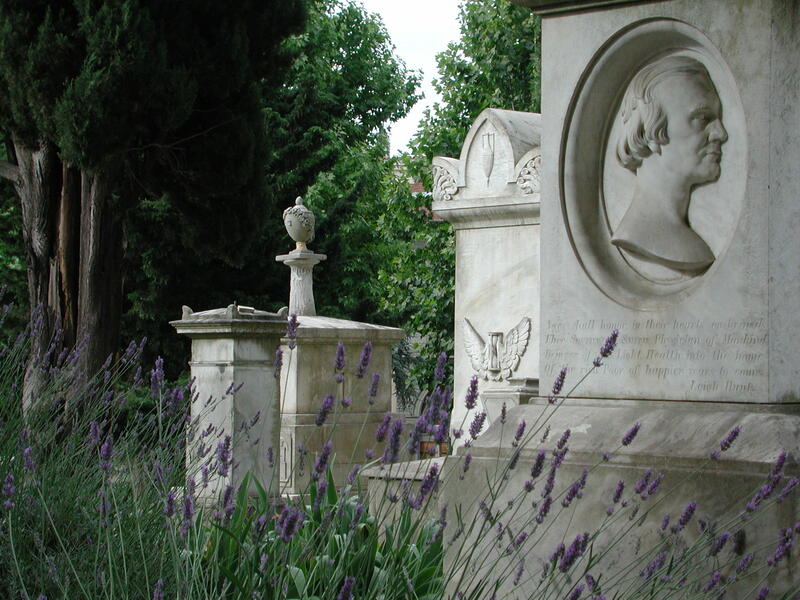 . . MENSES APRILES A.D. 1865/ Registro alfabetico delle persone tumulate nel Cimitero di Pinti: Trolloape [Trollope]/ Teodosia/ [Joseph Garrow]/ Inghilterra/ Firenze/ 12 Aprile/ 1865/ Anni 46/ 904/+/ Eglise Evangelique-Reformée de Florence Régistre des Morts: Theodosia Trollope, l'Angleterre/ Records, Guildhall Library, London: GL23777/1 N° 357 Burial 15/04 Age 46 Rev Pendleton; Marriage GL23774 N° 71+170/6 N° 71 03/04/48 Thomas Adolphus Trollope to Theodosia Garrow at HBM (Hamilton) bride d of Joseph Garrow, Devon, Rev Robbins; Baptism of child GL23775 N° 219/40, Beatrice Catherine Harriet 05/05/53, father Thomas Adolphus Esq, mother Theodosia, Rev O'Neill/ Thomas Adolphus Trollope, What I Remember, II.150-159, 166-168, & Chapter XVIII, who describes her as Florence's new Corinne; pp. 171-173. on her childhood friendship with Elizabeth Barrett Browning, both invalids to tuberculosis in Torquay/ NDNB entries for Theodosia Trollope, James Archibald Stuart-Wortley, whose grandson married first Theodosia's daughter, Bice, then Millais' daughter, Caroline/ See Fisher, Garrow, Trollope, Shinner. Chiesa Evangelica Riformata Svizzera, 1827-. 2009. B23G §624/ JOSEPH GARROW/ INDIA/ Cippo. Marmista ignoto. Sec. XIX, post 1857/11. Ambito toscano. Cippo in pietra serena andato a sostituire il cippo originario (non siamo a conoscenza dell'epoca in cui questo è avvenuto), frammenti cippo originario conservati, inciso con iscrizione sepolcrale in latino in lettere capitali e numeri arabi, epitaffio di Thomas Adolphus Trollope, genero di Joseph Garrow. [M: A: 104. L: 60. P: 19.] Iscrizione sepolcrale in latino in lettere capitali e numeri arabi: HIC JACET IOSEPHUS GARROW/ ARMr/ DE BRADDONS IN AGRO DEVON/ APUD INDOS NATUS/ A.D. 1789/ FLORENTIAN DENATUS/ A.D. 1857/ Registro alfabetico delle persone tumulate nel Cimitero di Pinti: Garrow/ +/ Giuseppe/ / Inghilterra/ Firenze/ 10 Novembre/ 1867 / Anni 67/ 624/ Eglise Evangelique-Reformée de Florence Régistre des Morts: Joseph Garrow, d'Angleterre/ / father of Theodosia Garrow-Trollope (12 Aprile/ 1865/ Anni 46/ 904/+/ C11E), stepfather of Harriet Theodosia Fisher (12 Novembre/ 1848/ Anni 37/ 393/ Latin epitaph written by Thomas Adolphus Trollope). See Giuliana Artom Treves, Golden Ring, pp. 137/ Records, Guildhall Library, London: GL23777/1 N°242, Burial 12/11, Rev O'Neill; marriage of child Theodosia 03/04/48 to Thomas Adolphus Trollope at HBM (Hamilton), Joseph Garrow, Harriet Fisher, Frances Trollope present, Rev Robbins/ Maquay Diaries: 13 Nov 1857/ Thomas Adolphus Trollope, What I Remember, II.150-159/ See Theodosia Trollope, Harriet Fisher. Chiesa Evangelica Riformata Svizzera, 1827-. 2009. C23G §393/ HARRIET THEODOSIA FISHER (GARROW)/ ENGLAND/ Cippo. Marmista ignoto. Sec. XIX, post 11/1848. Ambito toscano. Una tabella di marmo bianco, ora con frattura, dentro una stele di veined marmo sopra basamento di pietra serena: [M: A: 2; L: 82.5; P: 44.2; Veined Marble:: A: 58.5; L: 97; P: 7.3; P.s. : A: 29.5; L: 71; P: 20.] Iscrizione sepolcrale inglese incisa in lettere capitali e numeri arabi: SACRED/ TO THE MEMORY OF/ HARRIET THEODOSIA FISHER/ STEP DAUGHTER OF JOSEPH GARROW/ OF BRADDONS TORQUAY DEVON ESQ/ WHO DIED UNIVERSALLY REGRETTED/ AT FLORENCE NOV 12 1848/ AGED 37 YEARS/ FOR ONE SO LOVING AND DUTIFUL/ OF GENEROUS COMPASSIONATE AND/ SELF DENYING LET US NOT WEEP AS THOSE WHO HAVE NO HOPE FOR/ WE KNOW THAT OUR BELOVED/ HAS RECEIVED HER REWARD/ Registro alfabetico delle tumulazione nel Cimitero di Pinti: Fischer/ Enrichetta Teodosia/ / Inghilterra/ Firenze/ 12 Novembre/ 1848/ Anni 37/ 393/ Records, Guildhall Library, London: GL 23774 N° 26: Burial 14-11, Rev Robbins, Joseph Garrow's stepdaughter, Theodosia Garrow's half sister/ Thomas Adolphus Trollope, What I Remember, II.150-152, noting their mother was formerly a Miss Abrams and Jewish, who first married a naval officer, Fisher, then Joseph Garrow, whose own mother was East Indian; and that Harriet died of smallpox. Chiesa Evangelica Riformata Svizzera, 1827-. 2009. 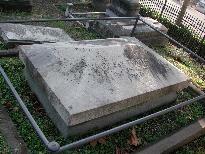 B15D §1220/ HIRAM POWERS/ AMERICA/ Tomba. Scultore, Preston Powers: Sec. XIX, post 1873/6. Ambito toscano. 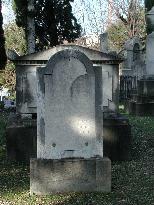 Tomba in marmo, tomba semplice e imponente, marmo sporco, poggiante su basamento in pietra serena, recinto in pietra serena e ferro. Intervento conservativo sul ferro Daniel Dumitrescu, anno 2008. [M: A: 35. L: 163.5 P: 104.5; P.s. A: 21. L: 155. P: 96. Recinto: A: 91. L: 261. P: 202.] 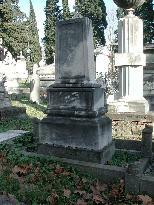 Iscrizione sepolcrale in lettere capitali e numeri arabi in piombo: HIRAM POWERS/ DIED JUNE 27TH 1873/ AGED 68/ Registro alfabetico delle persone tumulate nel Cimitero di Pinti: Powers/ Franco [later corrected to Hiram]/ Stefano/ America/ Firenze/ 27 Giugno/ 1873/ Anni 69/ 1220/ Eglise Evangelique-Reformée de Florence Régistre des Morts: F. Hiram Powers, America, Sculpteur, fils de Etienne Powers/ °=Niccolò, Alessio Michahelles, descendants.Belle Arti 1993-1997 scheda. Chiesa Evangelica Riformata Svizzera, 1827-. 2009. Contemporary Photograph in the Diary of Susan Horner, 1861-1862. see the entries for Horner and Zileri for members of this family. See Giuliana Artom Treves, Golden Ring, passim. 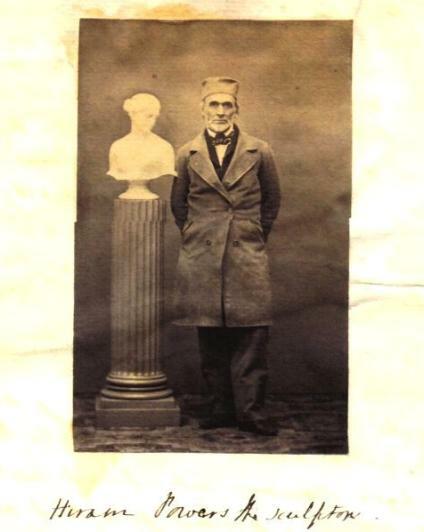 We are seeking descendants of Hiram Powers, son of Hiram Powers, the sculptor, who moved to Florida where he married and had a daughter. 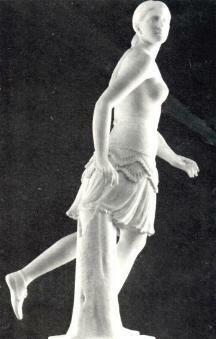 This statue, 'The Greek Slave', was the centrepiece of the Crystal Palace Exhibition and the subject of Elizabeth Barrett Browning's Sonnet. It shows a Greek Christian slave being auctioned by Muslim Turks. In her poem Elizabeth draws the analogy also to American enslavement of Africans, Russian enslavement of serfs. 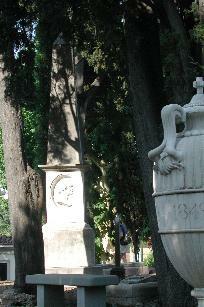 Near Hiram Powers' tomb is that of Nadezda (Hope) De Santis, a black Nubian slave baptized Orthodox, who died in Florence in freedom. Hiram Powers' 'The Last of Her Tribe', shows a Native American woman fleeing her captors. Every detail is observed down to the delicate sewing of the mocassins. The theme repeats that of 'The Greek Slave', a woman representing freedom against male oppressors. C20I §761/ THOMAS SOUTHWOOD SMITH/ ENGLAND/ Obelisco. Scultore: Joel Tanner Hart: Signature on neck of bust: J.T.HART. Sec. XIX, post 12/1861. Ambito toscano. Obelisco in marmo sul basamento quadrato dello stesso inciso. [M: A: 398; L/P: 105.5.] Iscrizione sepolcrale inglese incisa in lettere capitali e non e numeri arabi e romani: In Memory of SOUTHWOOD SMITH, Physician/ who through the promotion of sanitary/ reform in the principles of which he was/ the first to discover and through other/ philanthropic and literary labours was/ distinguished as a benefactor of Mankind/ Born at Martock, Somersetshire, England/ Dec 21, 1788, Died at Florence/ Dec 10, 1861// + THEN SHALL THE RIGHTEOUS SHINE FORTH AS THE SUN IN THE KINGDOM/ OF THEIR FATHER/ MATTHEW XII v.43// [Below Joel T. Hart's sculpted portrait medallion] / Ages shall honor, in their hearts enshrined, thee, SOUTHWOOD SMITH, Physician of Mankind/ Bringer of Air, Light, Health into the home/ Of the rich Poor of happier years to come/ Leigh Hunt/ Registro alfabetico delle tumulazione nel Cimitero di Pinti: Southwood Smith/ M.D./ Tommaso/ Inghilterra/ Firenze/ 10 Dicembre/ 1861/ Anni 73/ 761/ Eglise Evangelique-Reformée de Florence Régistre des Morts: Southwood Smith, l'Angleterre/ Southwood Smith's granddaughter, Octavia Hill, continued his work, introducing housing reform in slums]/ Records, Guildhall Library, London: GL23777/1 N° 301, Rev O'Neill/ Belle Arti 1993-1997 scheda. Chiesa Evangelica Riformata Svizzera, 1827-. 2009. Mediatheca 'Fioretta Mazzei', http://www.florin.ms/spiritage.html has New Spirit of the Age, ed. Hengist Horne and Elizabeth Barrett Browning. Hengist Horne. (With the assistance of Elizabeth Barrett Browning.) A New Spirit of the Age. Essays on Charles Dickens, Lord Ashley and Southwood Smith, Walter Savage Landor, Mrs Trollope, William Wordsworth and Leigh Hunt, Alfred Tennyson, Harriet Martineau, E. B. Barrett, Robert Browning, Sir Edward Bulwer Lytton, Mrs Shelley, Thomas Carlyle, etc. London: Henry Frowde, 1907. JBH, 2007. Thomas Adolphus Trollope. The Story of the Life of Pius the Ninth. London: Richard Bentley, 1877. 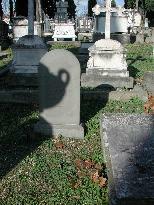 Syracuse University, Florence, 2005. Vol. II of two volumes. The Library would appreciate Vol. I of this book. 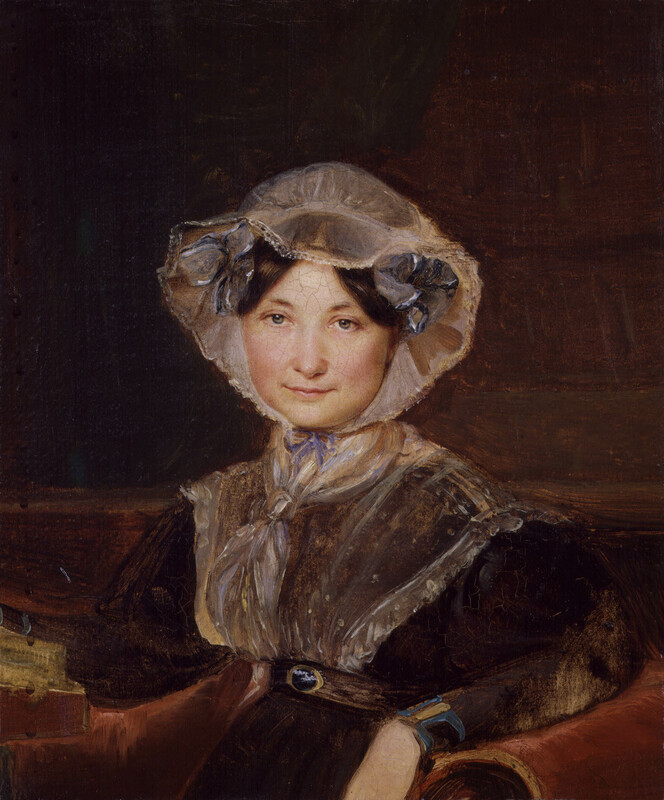 Frances Eleanor Trollope. 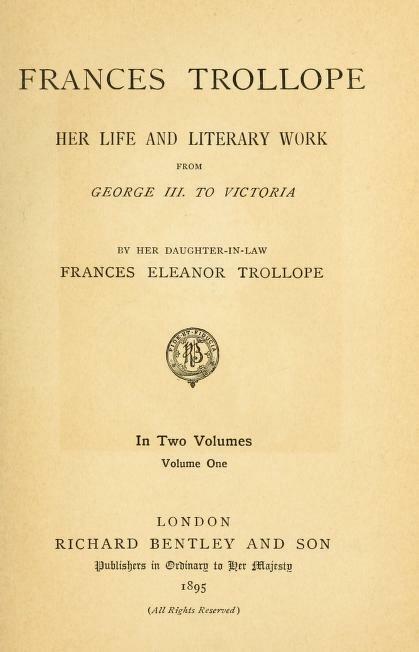 Frances Trollope: Her Life and Literary Workd from George III to Victoria.